So firstly, sincerest apologies, it has been about three years since I last posted. I guess that’s what happens when you start a family! 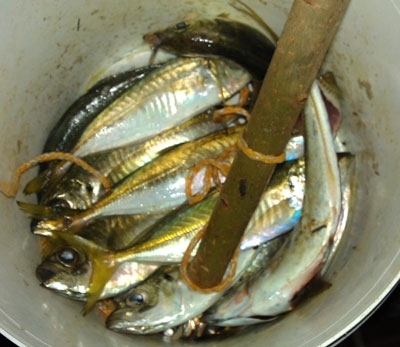 There hasn’t been any shortage of fishing though, so I will look to blog about all the fishing during that time. 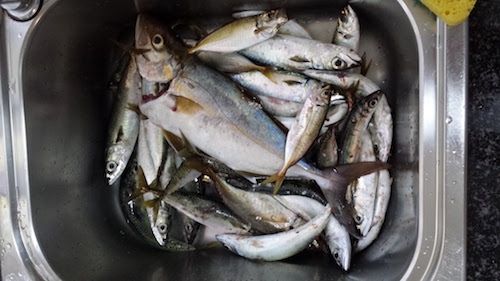 So in this post, we caught a thumper trevally at about the 40cm mark and took home plenty of bait as we were running well short. The trevally have a tell-tale fight of swimming in a circle and you bring them up, and tend to punch quite a lot above their weight! 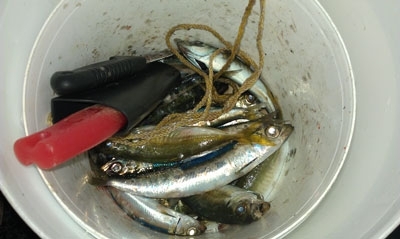 The baitfish were a mix of pilchards and yellowtail. Freezing conditions and an early sunset have cut short our fishing trips, but we had a few hours before a 5pm sunset. 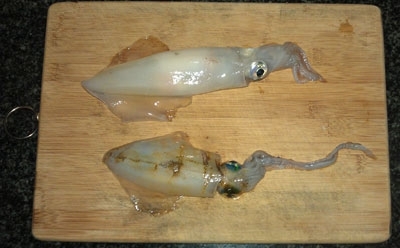 I was able to hook up a few squid after a few goes, but only the two. One of them being a tiny calamari, a good sign for the months ahead. They don’t seem to school as much as in the summer. Towards sunset, we were able to get a few baitfish, a mixture of yellowtail and pilchards. The Spring weather was beginning to heat up and give rise to perfect conditions for the pelagics. We were getting plenty of baitfish first up, so it was a good sign. Dad had a live bait on and I was busy going for squid. So we didn’t have to wait for long for dad to hook up. He called it a salmon judging by the strong fight, yet not as strong as the kingfish. After a patient 5 minute fight, we brought up a 55cm beauty! I was able to hook up on some squid towards the end of the day for a nice mixed bag. So, it has been a long time between drinks (fishing posts), for which I must apologise for. In between planning a wedding, getting married, changing jobs and a honeymoon, I have been able to get in some good fishing but have not had time to add posts. Now that I have some time on my hands, I have a large backlog of posts to get through. A beautiful day for fishing full of sunshine and not a drop of wind. Unfortunately experience tells me that not much tends to show up when it is dead calm. We were lucky enough to hook up on a school of baitfish. I put the bait rod away and tried to hit some squid for the rest of the afternoon. It took ages, but I managed to get the one, just a little tiddler. Notice that I used the small squid jig. I tend to find that there are a lot more squid in the hotter months, but they are smaller, so I generally put the large jig away. Tried a few of the smaller ones live for no result. Had a few bites and one was taken, but I think it was by a crab. 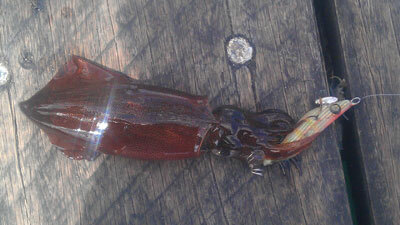 Switched over to the squid jigs, but wind was terrible for casting and no squid about.